Munich Airport, officially known as Franz Josef Strauss International Airport, is Munich's sole international airport. It is located 28km (18 miles) to the north-east of Munich, close to the towns of Freising and Erding. In 2005, some 28.6 million passengers passed through the airport, making it the second busiest airport in Germany after Frankfurt and the eighth busiest in Europe. 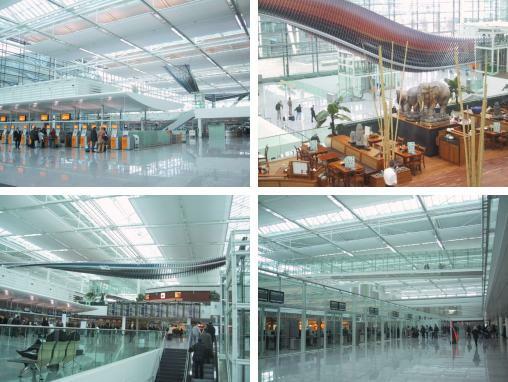 In 2006, it was named "Best Airport in Europe" for the second consecutive year and the third best in the world. It is named after Franz Josef Strauss, a high-profile CSU politician who died in 1988. The current Munich airport was opened on the Erdinger Moos in 1992. The previous airport was in the eastern suburb of Riem. A second terminal was opened in 2003. All Lufthansa and Star Alliance flights depart from Terminal 2. The two terminals are located just a short walk across the central concourse from each other. The German government is currently conducting a feasibility study for a Transrapid Airport Link. This is a high-speed magnetic levitation train. It would cut journey times between the Munich airport and the city centre to just 10 minutes each way. However, the enormous â‚¬1.6bn cost of the project makes it unpopular with many people in the region and it is not even clear if the necessary funding can be raised. There are also controversial plans for a third runway at the airport. The airport argues that the additional capacity is needed to meet future demand. Transport to and from Munich Airport is easy via the S-Bahn lines S1 or S8. Trains leave for Hauptbahnhof approximately every ten minutes. The journey time is a bottom-aching forty minutes. The Lufthansa Airport Bus departs every twenty minutes from Hauptbahnhof, and is particularly convenient for passengers living close to its stop in Nordfriedhof. Train passengers from Regensburg, Nuremberg, Passau and Landshut can take Bus 635 from Freising station direct to the airport. A taxi to central Munich will cost upwards of â‚¬50. One of the cheaper airport transfer companies in Munich is myDriver airport Transfer MunichAnother affordable option is DriveNow car sharing Munich Airport where you can pick a car and drive directly to Munich. Or you can take a car from the city and park it at the airport. It can be cheaper than other forms of transportation if you are 2 people. This page has been viewed 66,238 times.